The bigger picture is that Liverpool are still in it, it's a good result at home, they haven't conceded and they've got every chance of going to Bayern and winning the game. I just believe they could have given themselves a better chance by creating more at Anfield. And I was hoping the fans would have been a bit louder, it was very quiet. I think the fans were a bit nervous. If you don't get a goal, you can't relax. Jordan Henderson was brave. He took the ball in positions where he had players round him. He wanted to get Liverpool up the pitch and pick the right passes. He wanted to take charge of the situation for Liverpool tonight. For 60 minutes he did it. For the half an hour that Bayern nullified him, Liverpool weren't as good. Former Manchester United defender Rio Ferdinand on BT Sport: ""If I'm a Liverpool player or the manager I'd be happier. I'd think I can go there and score. "Liverpool will put a marker down if they put in a performance at an experienced, well drilled Bayern Munich team." Former Bayern Munich midfielder Owen Hargreaves on BT Sport: "It could be a special game, I just expect Liverpool to do more offensively." Right, I'm going to sign off now. Read the Liverpool report here. Or the Barca one here. Or about Neymar crying here. And I'll leave you with some of the post-match punditry. Liverpool extended their unbeaten home run in all European competitions to 20 games (W14 D6) - this was their 11th clean sheet in those 20 matches. 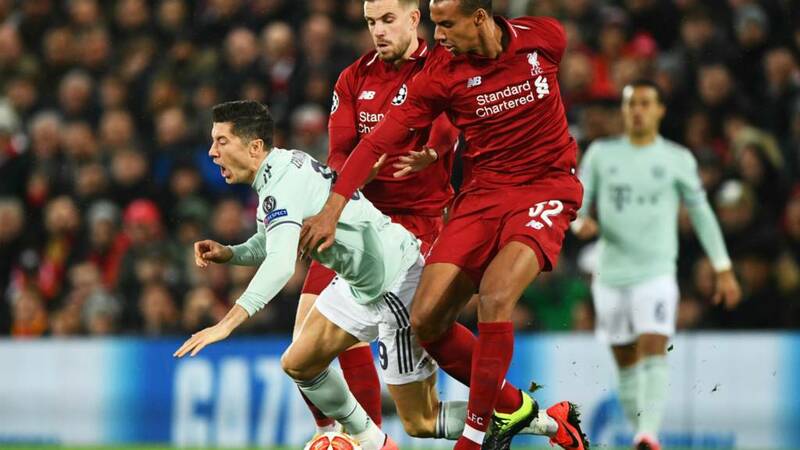 They have played out a goalless draw in the first leg of a Champions League knockout tie for only the second time, and the first since the 2004-05 semi-final against Chelsea. Bayern Munich failed to attempt a single shot on target in a Champions League game for the first time since May 2015 in their semi-final first leg away at Barcelona. Each of Bayern Munich’s last three visits to Anfield in European competition have now finished 0-0. Lionel Messi attempted eight shots in a Champions League knockout stage match for the first time since 3 April 2012 - when he had nine in a 3-1 home win over AC Milan. He scored twice in that game. The player rater has shut now. Your man of the match... Bayern defender Mats Hummels. Jordan Henderson was the only Liverpool player to get more than 6/10. Check out the scores here. Former Manchester United defender Rio Ferdinand on BT Sport: "Liverpool will put a marker down if they put in a performance at an experienced, well drilled Bayern Munich team." Considering the absentees a clean sheet is fantastic. I have never understood the hype surrounding playing at home in the second leg. We know that 1-1 will take us through, pressure is all on Bayern. No goals for, but none against without VVD in the side. Bayern will have to attack and Liverpool can now play on the break, which should suit them in the second leg. I'd rather a 0-0 than a 2-0 loss in the first leg at home anyway. James: The phrase 0-0 at home is a good result is the biggest myth ever. Richard Tipper: When are we going to learn to take Salah off if he's not performing. Firmino didn't deserve to be hooked and how has Origi got himself ahead of Shaq in the pecking order. Seriously frustrating because we could've caused them more problems with the right personnel. Nokeeroe: Advantage Bayern? I don’t think so. Liverpool WILL score in Munich, and with the Reds excellent defence, marshaled by the masterful Virgil van Dijk, the very least Liverpool can hope for in Germany, is a score draw. Bayern striker Robert Lewandowski to BT Sport: "It was a tough game. Maybe we could have scored a goal. "Liverpool are a very dangerous team. We had to play compact for the 90 minutes." Will they be more attacking in the second leg? "Maybe. You can never say what will happen in the Champions League. We'll need to score if we want to get into the next round. I hope we can play better at home." And here's some more from JK again. "If Bayern had been full of confidence we might have had more space. Both centre-half pairings had a lot of ball and played around. Not a lot of things happened. We had our moments and in those moments you have to score. "It was an intense game for both sides. It is not a game we will remember in 30 years. It's the result we have and we will wok with that." More from Klopp: "It was a clean sheet without the big man [Virgil van Dijk]. A lot of people wouldn't have expected that. The defending was good. A lot of things were really good. I’m not over the moon but I’m completely OK with the game." Liverpool boss Jurgen Klopp to BT Sport: "We made life more difficult with the last pass today - about 10 or 12 times a promising situation [fizzled out]. We can play better. We should play better. "In the first half we had the bigger chances. I can't remember any chances for either side in the second half. It wasn't a Champions League night from that point of view. From a result point of view, it's OK. It's not a dream result but it's a good one." You can rate the players from both sides between Liverpool and Bayern Munich by heading over here. Robert Lewandowski only touched the ball 34 times in 90 minutes. One shot off target.